The 1/5th Battalion War Diary recording the burying of dead on the 15th October whilst holding the Hohenzollern Redoubt. Letter from Mr W Benstead to the War Office written on April 19th 1925 following the exhumation and reburial of his son 1579 Pte. A W Benstead. In researching the Sherwood Forester’s (Notts and Derby) attack on Hohenzollern Redoubt as part of the 46th North Midland Division attack on Fosse 8 there is an interesting little puzzle. During the 13th to 15th October the 1/5th, 1/6th, 1/7th and 1/8th Battalions of the 139th Notts & Derby Brigade suffered approximately 110 men killed, the vast majority of which don’t have a known grave and are commemorated on the Loos Memorial. See here Sherwood Oct_Dec 1915. On the 13th October they were ordered to the Hohenzollern Redoubt and had 43 Officers and men killed; 36 have no known grave. Of the other 7 men, all these seem to be post war reburials in various cemeteries around the Loos area. The Army Form B.103 “Casualty Form – Active Service” records the location of the graves of 17 Robin Hoods (all listed on the Loos Memorial) as 36 A.28.C.8.4. In addition the remains of 3 of the men that were buried at A.28.C.8.4 were subsequently reburied in other cemeteries after the War. 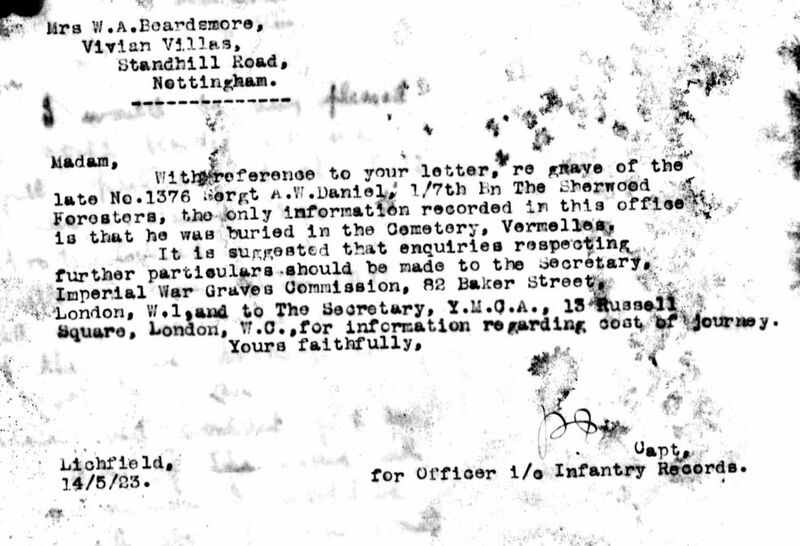 In March 1923, Mrs Bates (William Daniel’s Aunt) writes to the War Office asking for more information on where Alex Daniel’s grave is located since she is visiting France in June and wished to visit the grave. 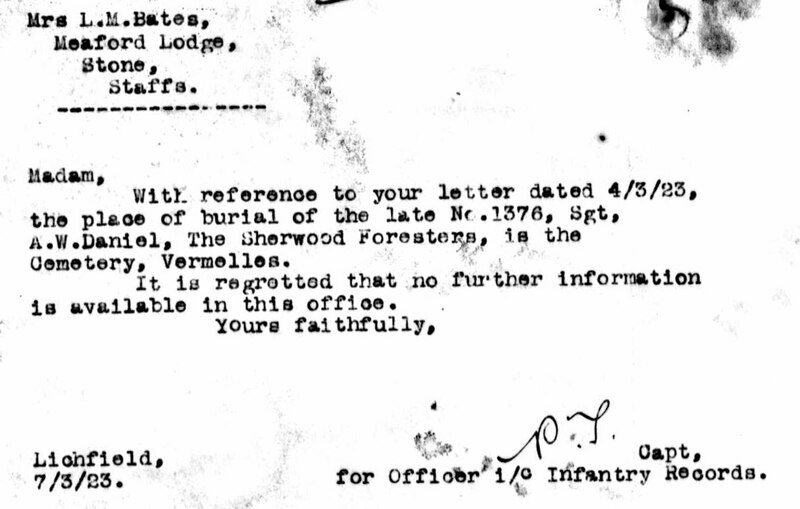 In a second response on the 14 May 1923; “the only information recorded in this office is that he is buried in the Cemetery, Vermelles”. “place of burial, Cemetery Vermelles, Bethune Combined Sheets No 36.A.28.C.8.4.” However, the body of Alexander William Daniel was not recovered after the War and he is Commemorated on the Loos Memorial. Many burials are know to have occurred in the Redoubt itself, but there are few written records. 755 Cpl. Harry Betts of the Robin Hood Rifles was recorded as buried “10 paces right of signallers dugout Hohenzollern Redoubt”, however his body was not recovered after the War and he is Commemorated on the Loos Memorial. 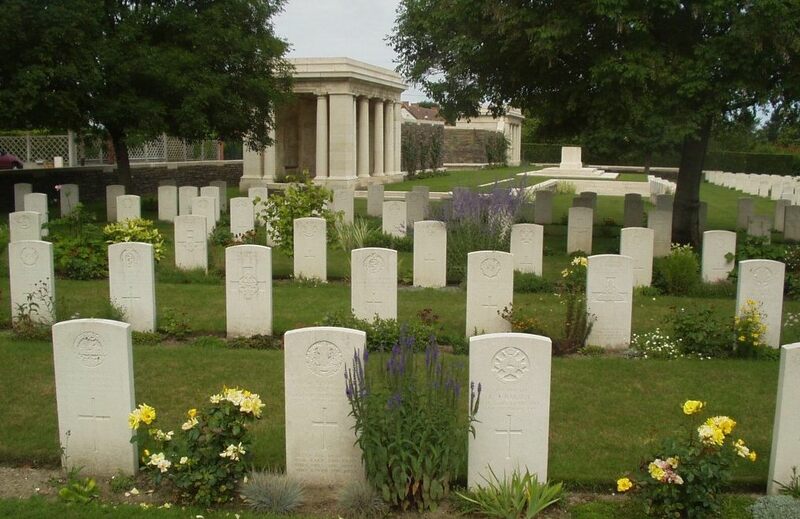 Thirty men of the 46th North Midland Division who were killed in action between 12th-14th of October are buried in Caberet-Rouge British Cemetery at Souchez. These men are all buried in Plots started after the Armistice and are almost certainly re-enternments. 1866 L/Cpl. 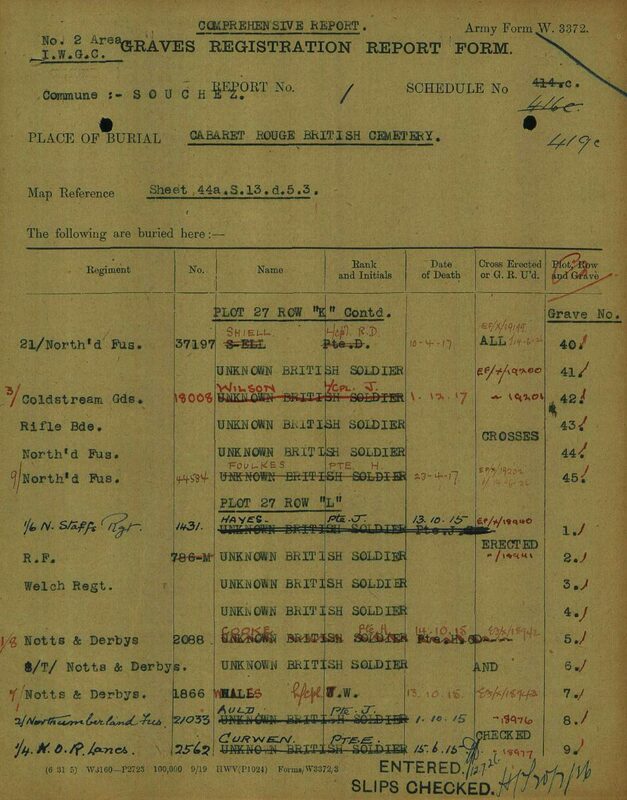 James William Whiles (1/7th Battalion) was recovered from map reference 44.A.G.4.D.25.70 (information from CWGC – courtesy of Chris @ Great War Forum). 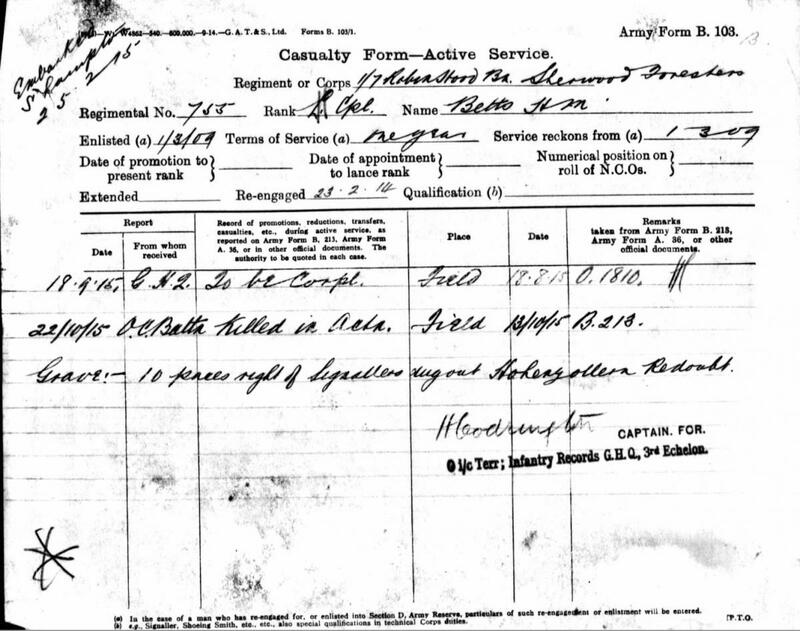 However, his Casualty Form – Active Service records the incorrect map reference A.28.C.8.4. 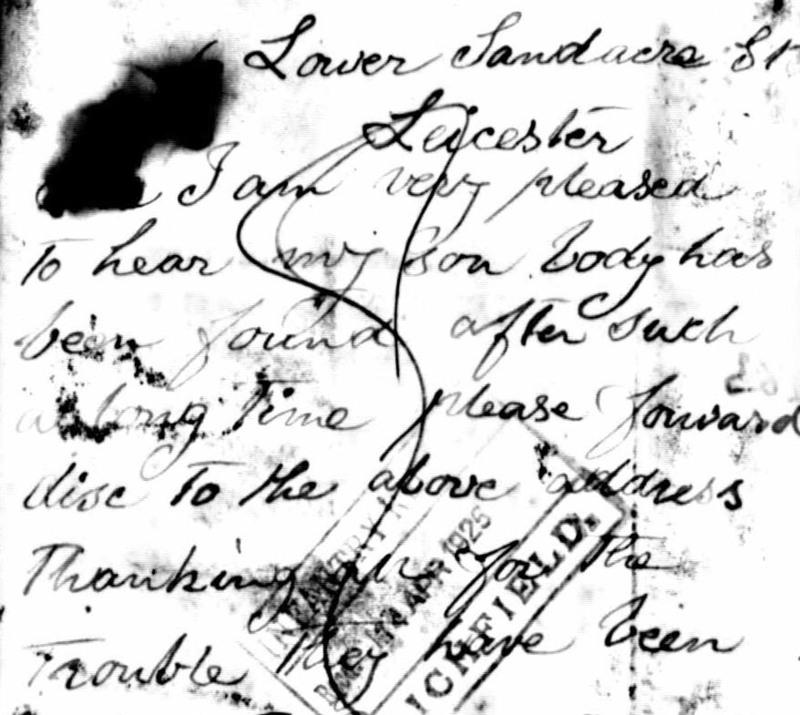 Envelope containing the very corroded remains of James While’s identity disc; however, this was sufficient to identify his body, which was subsequently reinterred. 2088 Pte. 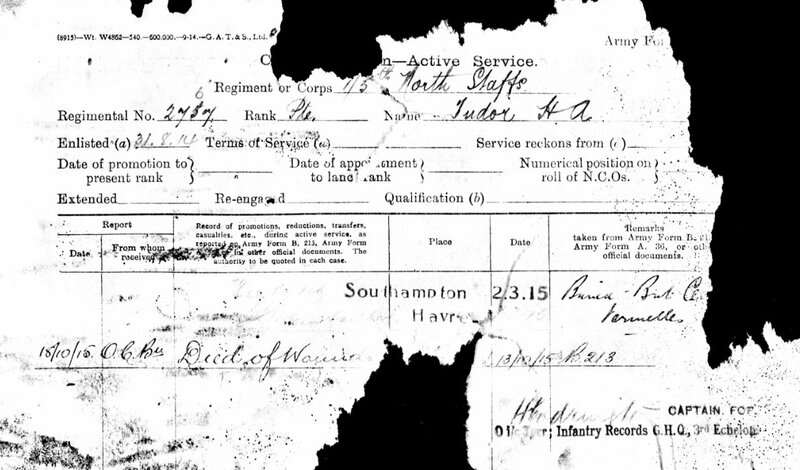 Harold Cook (1/8th Battalion) was recovered from map reference 44.A.G.4.D.25.70 (information from CWGC – courtesy of Chris @ Great War Forum). 2153 Pte. Samuel Benjamin Smith (1/8th Battalion) was reburied from reference 44.A.G.4.D.30.65 (information from CWGC – courtesy of Chris @ Great War Forum). 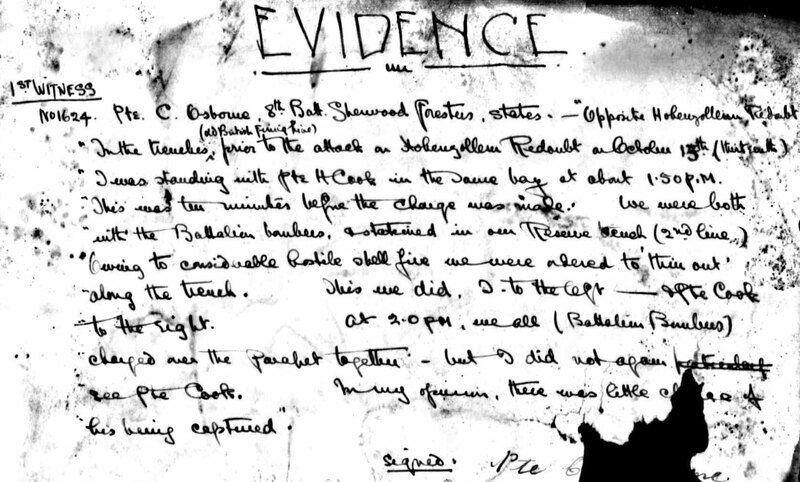 Eye witness report by 2162 GR Carr stating that he did not see Samuel Smith after the Battalion had commenced the attack on the Hohenzollern Redoubt. 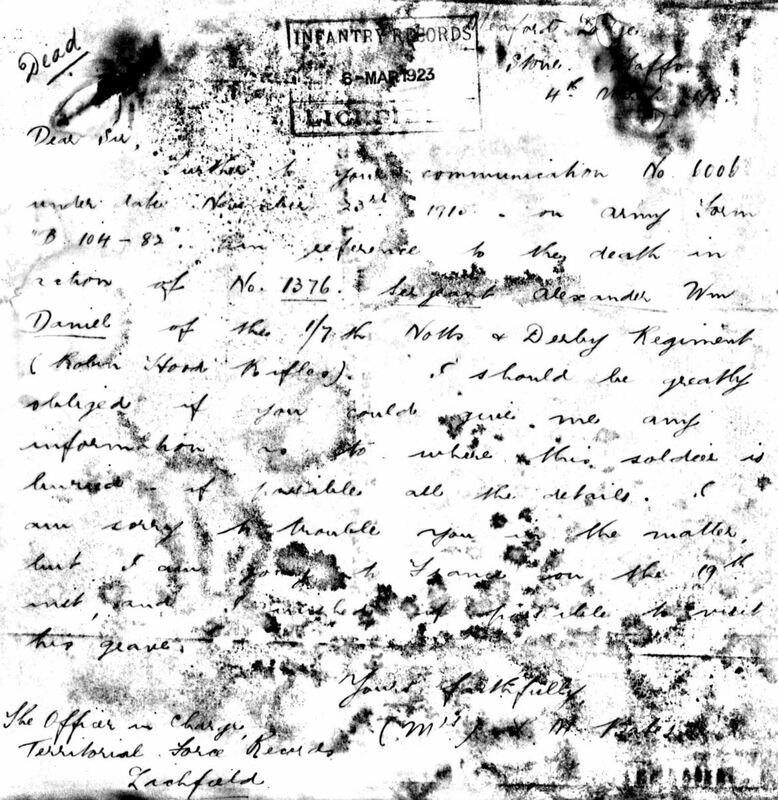 Envelope containing the very corroded remains of Samuel Smith’s identity disc; however, this was sufficient to identify his body, which was subsequently reinterred. Army Form B. 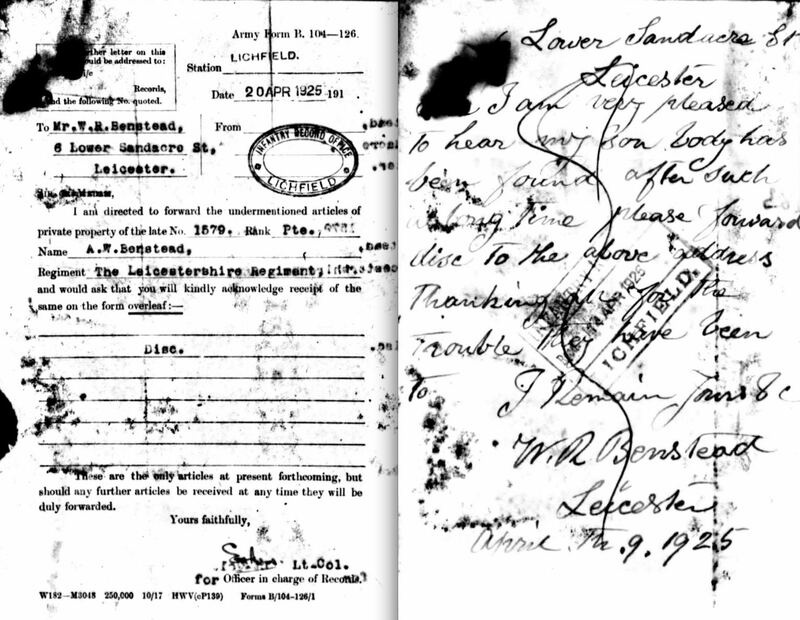 104 – 126 informing Mr Benstead of Lower Sandacre Street in Leicester that the identify disc from his son 1579 Pte. 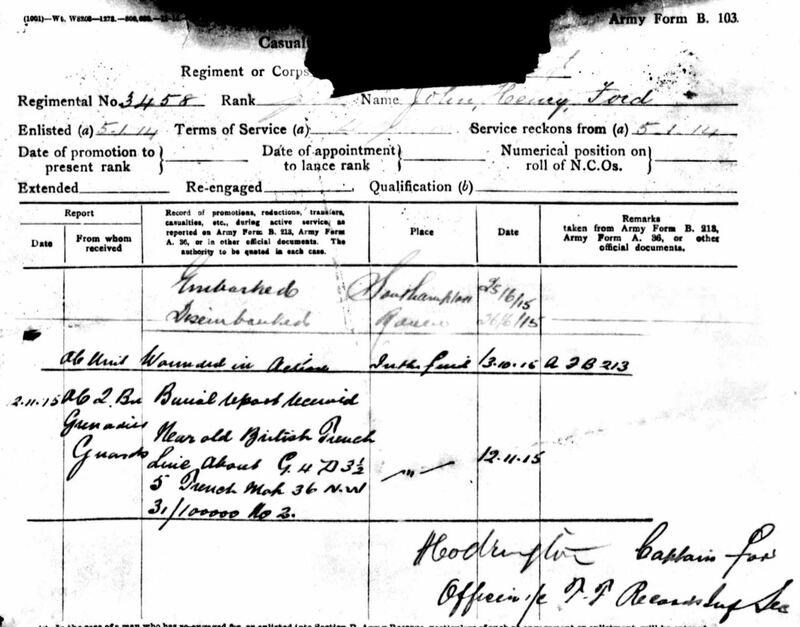 A W Benstead of the 1/4th Leicesters is being returned to his family. 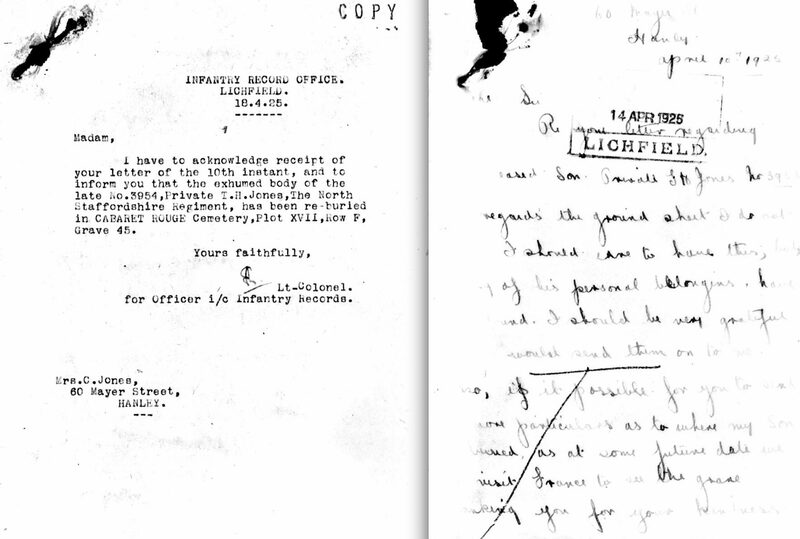 In his response Mr Benstead is pleased to hear that his son’s body has been found. 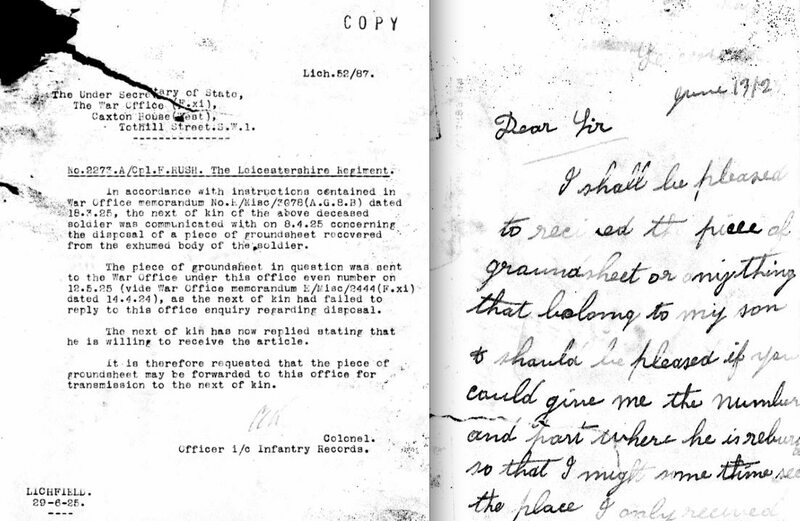 A letter from the War Office in 1925 to Mrs Jones informing her that the body of her son 3954 Pte. 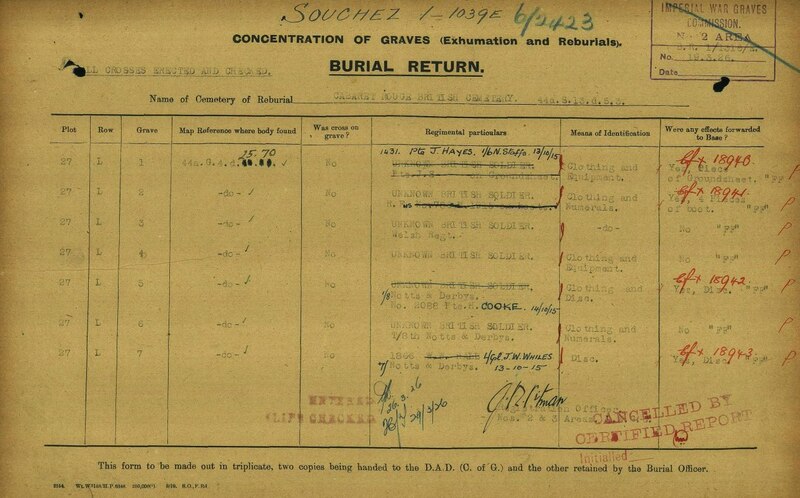 TH Jones of the 1/5th North Staffs has been exhumed and been re-buried in CABARET-ROUGE Cemetery. In her response Mrs Jones asks for the ground sheet that he was originally buried in and for details of the Cemetery so that she may one day visit his grave. 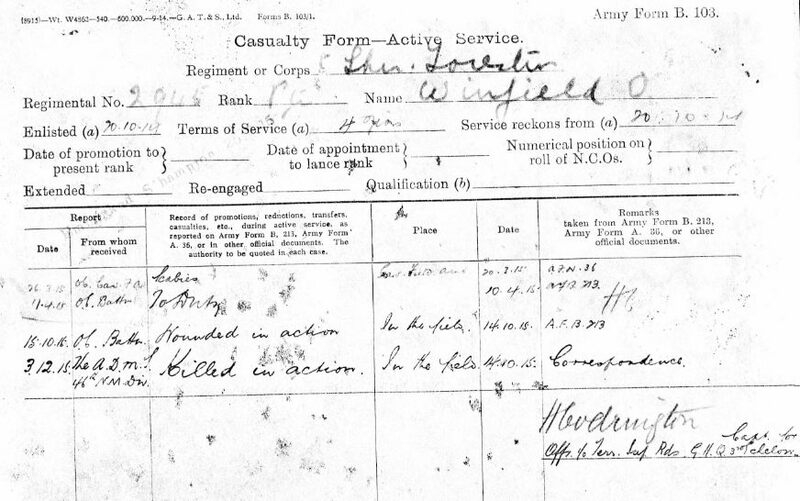 Casualty Form – Active Service for 3458 John Henry Ford of the 1/6th North Staffs recoding his burial at about G.4.D.3.5. ‘near old Britsh Trench line’ by the 2nd Grenadier Guards. John Ford’s body was eventually recovered and he is now buried in CABARET-ROUGE Cemetery. 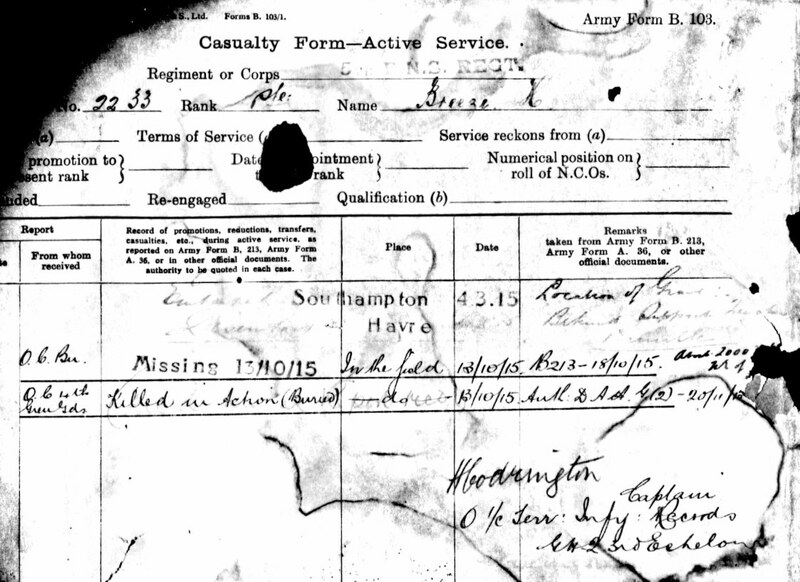 Casualty Form – Active Service for 1607 Pte. 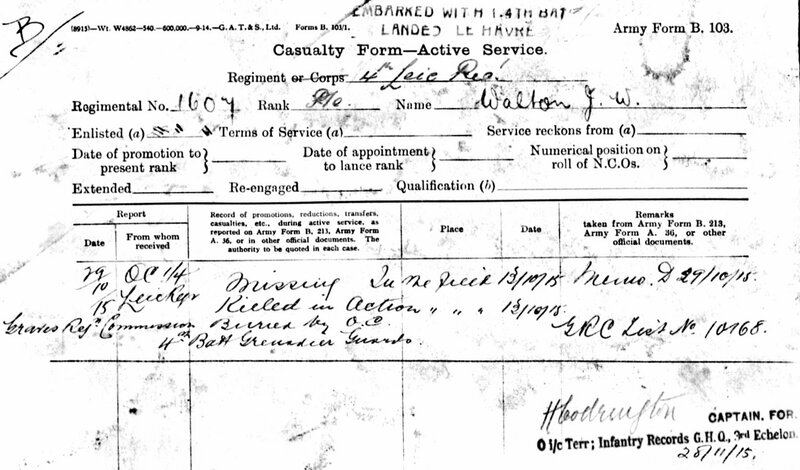 John William Walton of the 1/4th Leicesters showing his burial by the 4th Grenadier Guards and recorded by the Graves Registration Commission. John Walton’s body was eventually recovered and he is now buried in CABARET-ROUGE Cemetery. 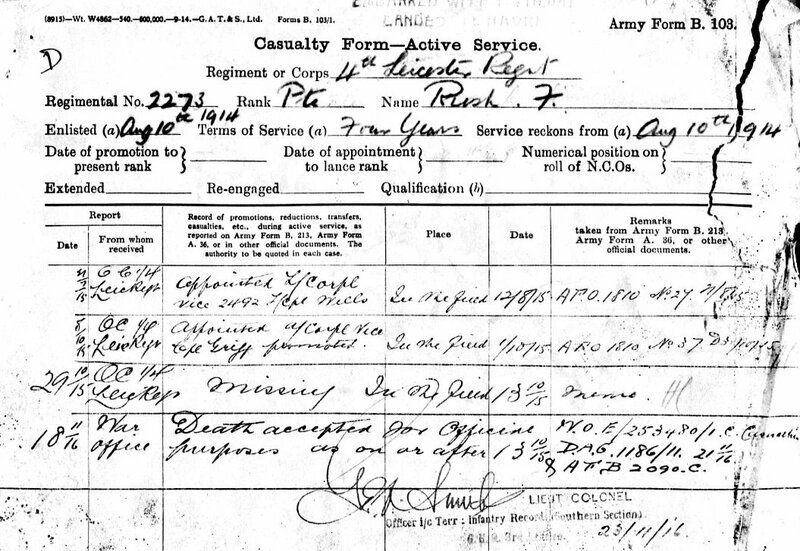 Casualty Form – Active Service for 2233 Pte. 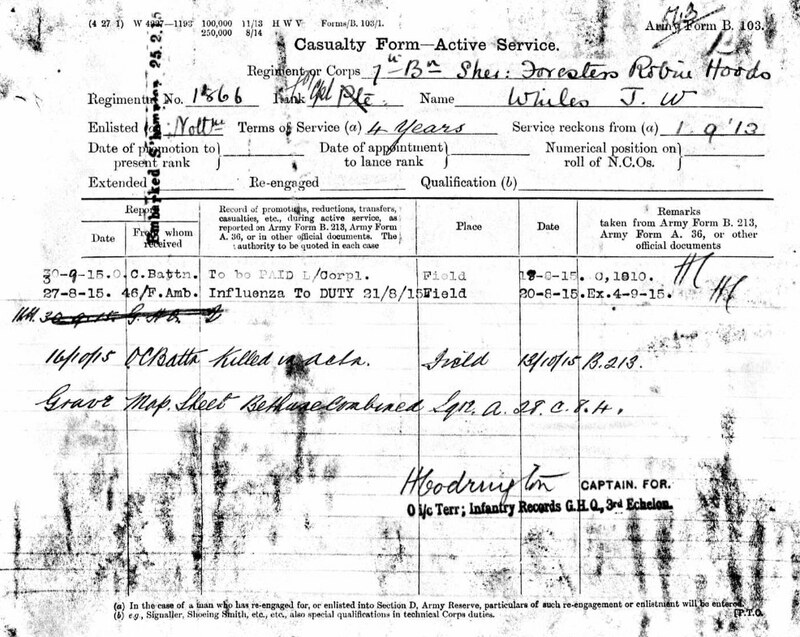 Breeze of the 1/4th Leicesters showing his burial by the 4th Grenadier Guards and recorded by the Graves Registration Commission. John Walton’s body was eventually recovered and he is now buried in CABARET-ROUGE Cemetery. 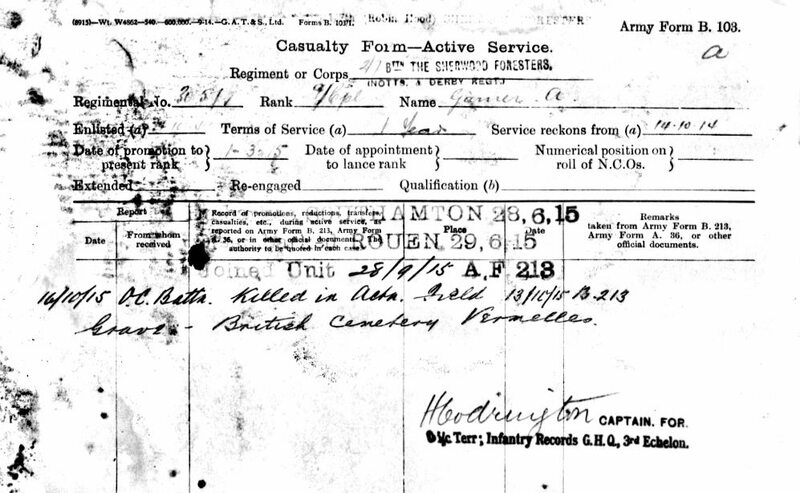 Casualty Form – Active Service for 2273 Pte. Rush of the 1/4th Leicesters recording John Walton’s body was eventually recovered and he is now buried in CABARET-ROUGE Cemetery. The cemetery was begun in August 1915 and during the Battle of Loos when the Chateau was used as a dressing station,Fifteen men of the 46th North Midland Division are buried in Vermelles British Cemetery in Plots I and IV. See here Vermelles 2. Plot I was completed in 1915 and therefore most likely contains original burials. 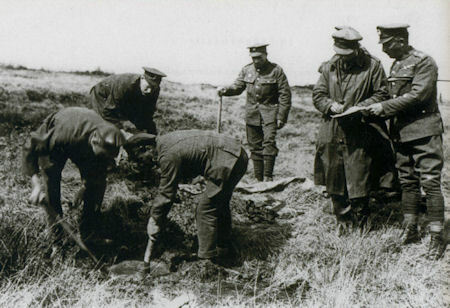 Plot IV contains the graves of four men from the Staffordshire Brigade whose bodies were recovered after the War. 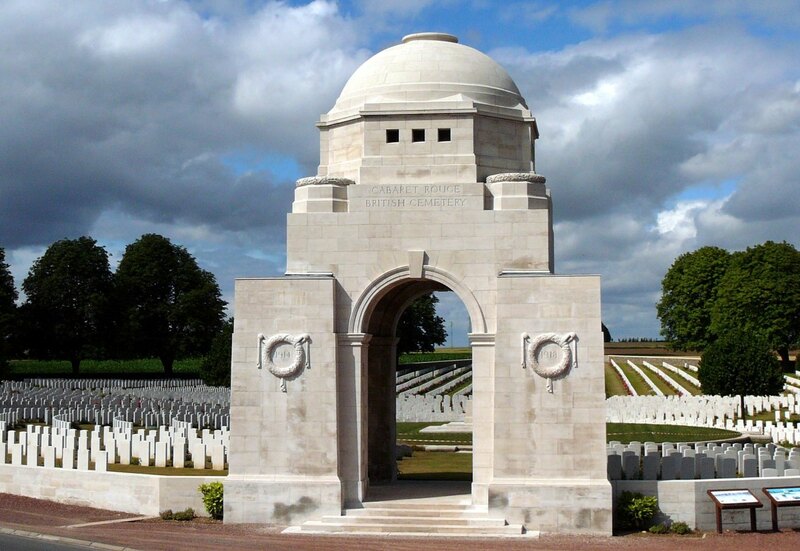 Despite being buried at the time and their graves recorded on burial reports, the bodies of numerous men were not recovered or identified after the war and there names are now commemorated on the Loos Memorial to the missing. 2175 Pte. 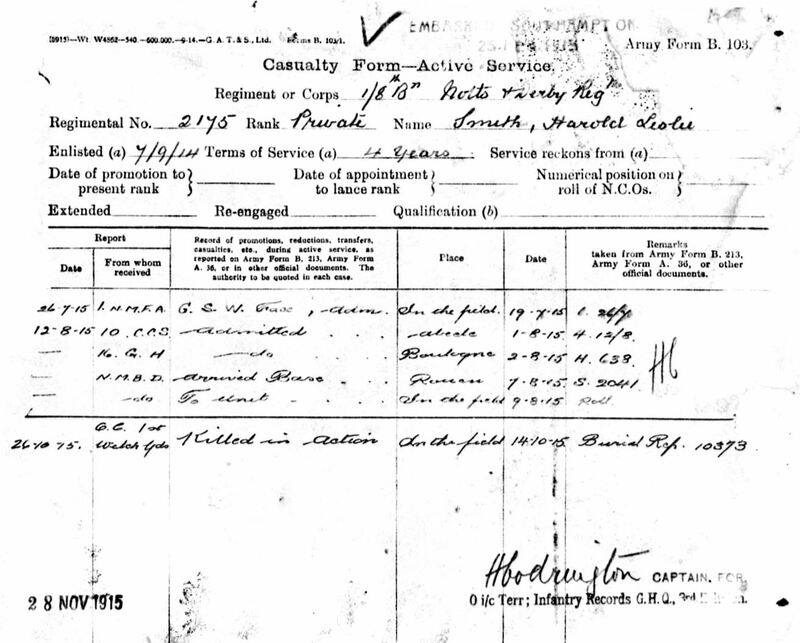 Harold Leslie Smith of the 1/8th Battalion Notts & Derby Regiment who was buried by the 1st Welsh Guards and his name recored on burial report 10373 dated 26th October 1915.